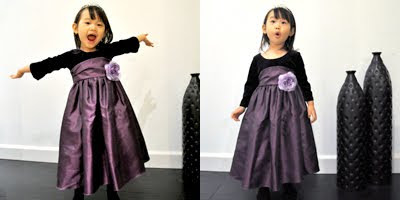 Bridal Bee's Blog on Flower Girls & Beyond: Gleeful Gaby In Her Holiday Dress! Gleeful Gaby In Her Holiday Dress! Check out this extra adorable photo of our little customer Gaby wearing one of our holiday dresses! Isn’t she as cute as a button? We uploaded two of her pictures on our website under the product page; her personality truly shined through in both of the photos we received of her and we just felt the need to share them with all of our customers and fans! She looks so cute and excited to be wearing her gorgeous purple dress! She is also wearing one of our princess tiaras. If you check out the product page, you’ll find a silly picture of her too! That goes to show that not all princesses have to be prim and proper! Princesses can have fun and be silly all while looking beautiful! Gaby is wearing one of our holiday dresses, but we still have a few in stock! In addition to the purple dress that Gaby is wearing, we have red and burgundy versions as well! We wouldn’t recommend wearing a velvet dress during the spring and summer months, but as long as this strange, wintry chill lingers in most of the U.S., why not? Want to look like Gaby or save this for your holiday dress look book? Here’s what gleeful Gaby is wearing! Gaby is wearing our Winter Long Sleeve Purple Velvet Holiday Dress, Item Id: GG3290G. If you are preparing for the holiday season, this is a dress that will work out wonderfully for your little girl. She will no longer have to suffer the consequences of looking absolutely gorgeous in a dress that hardly keeps her warm! This empire waist dress has a long-sleeved velvet bodice in a rich, deep purple color. Mmm, exquisite and warm! The tea-length skirt is made of an iridescent purple taffeta that subtly sparkles in the light! A large floral accent adorns the wide, pleated waistband that converts into an adjustable waist sash at the back! This is a lovely dress that will not only keep your little girl warm and comfy but adorable and happy too! 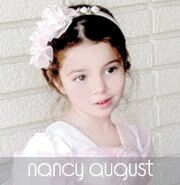 If you would like to share your photos with us, send them to: Info@NancyAugust.com! Dallas Shines in our Gold Baby Dress!